How do I connect / disconnect my account with several computers? This article will explain how to connect or disconnect your Gyazo account with multiple computers. You can connect 2 or more computers to one Gyazo account. For example, it allows you to have one Gyazo account with Mac and Windows PC. You'll see images taken with Gyazo App on Mac and Gyazo App on Windows PC in the same history page. 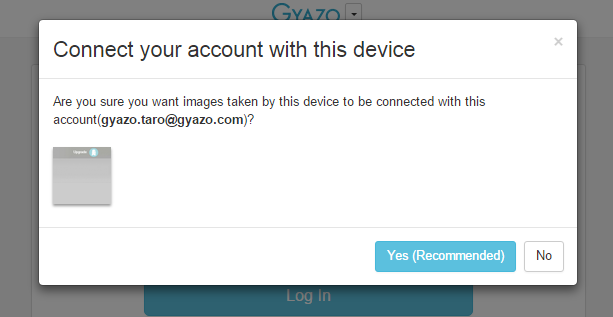 (1) On the first device, please confirm if you already have a Gyazo account. If you haven't signed up yet, please create a new account. (2) On your second device (the device you'd like to link), install Gyazo App. (3) On your second device, launch Gyazo App and take a screenshot. A new tab will open. (4) On the web browser of your second device, access login page at https://gyazo.com/login . Login with your registered email/password. (5) You will see the following message. Click "Yes" to connect your account with your second device. Now your Gyazo account is connected with 2 devices. You can now see your image history with all images taken by either of your computers in one place. You can confirm the connected computers at Settings page at https://gyazo.com/settings . To disconnect a computer from your account, please go to your Settings page at https://gyazo.com/settings , click "Connected devices", and click "Unlink". The images which were uploaded so far will not be deleted even when you disconnect a computer.